I recently got a chance to try out something I’ve been wanting to try for some time now: a deprivation tank. 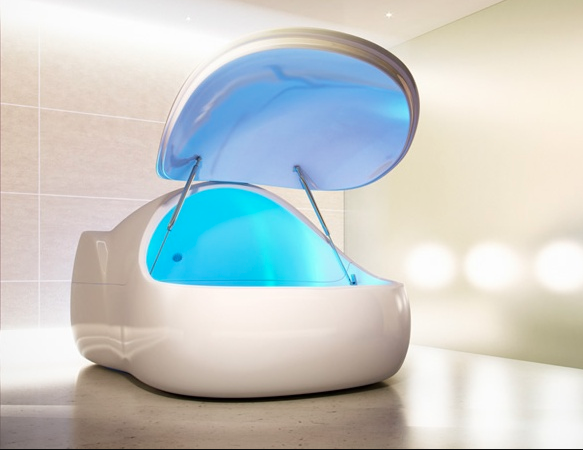 For those not in the know, a deprivation (or float) tank is a self contained pod that has about a foot of super concentrated salt water. The high salt concentration makes you incredibly buoyant, just like the dead sea, and makes it so that you float on top of the water without sinking in very much. The water is kept the same temperature as your skin so that the awareness of the water is lessened and there is also an option to turn out all the lights and drown out all the sound to truly deprive your senses. The feeling is quite strange. I’ve never been up in space but I imagine that it is similar to what this feels like. You can feel yourself being supported but at the same time you’re not aware of your weight. Normally when you’re in water you feel your weight pulling you down so you have to work to stay afloat. Even when you lay on a raft you are aware of your weights impact on the raft. This is different. Once you maintain your positioning in the center of the pod so that you can’t touch the sides and the ripples in the water calm down, you truly have a sense of floating in space, especially with the lights out. When your brain isn’t being bombarded by visual, auditory, and proprioceptive stimulus it does some pretty crazy things. Originally my brain starting creating it’s own stimulus. I started seeing shapes and colors, much like when you’re laying in bed about to fall asleep. Even though your eyes are closed, you still have visual stimulus being created. Then I started hearing music. The music wasn’t any song I’ve ever heard or even a type of music that I like but for a period of time I got to listen to some really complex electronica type music. Eventually my brain just started going down the rabbit hole of thoughts and experience. I just let it flow where ever it wanted to go and decided to just sit back and enjoy the show. At some point I fell asleep because I started having hypnagogic jerks; those little muscle spasms you have as you’re falling asleep. This caused the water to ripple which then woke me up. After about 75 minutes in the tank, I got out and showered off. The biggest benefit I took from it was an overall sense of relaxation. It heightened my mood and made me feel good; physical, mentally, emotionally, and spiritually. I was originally worried that I might freak out during the experience but never had any type of feeling. It was very relaxing and something I would suggest everyone give a try. Who knows where your mind will take you.